I went to Aldi this year to get a lot of my holiday baking ingredients. I definitely saved a ton of money doing it that way, but I also bought more than I needed. For example, I bought 3 bags of milk chocolate chips. I didn't even use any in my holiday baking. 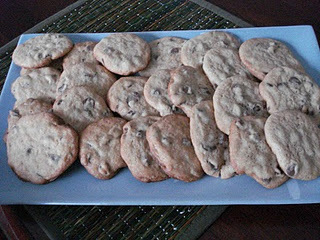 So, this morning, I was craving chocolate chip cookies, and conveniently there is a recipe on the bag of the Baker's Corner Milk Chocolate Baking Chips...so I made them. This recipe made more than I thought it would. I figured I would end up with 1-2 dozen, but I ended up with double--4 dozen! Had I known that, I would have made them for Christmas! Preheat the oven to 375 degrees. Combine the melted butter, brown sugar, eggs, water, and vanilla and mix well. Stir in the remaining dry ingredients. Mix in the chocolate chips. Drop by teaspoonfuls onto an ungreased cookie sheet and bake for 8-10 minutes or until lightly browned. I don't go to Niagara on the Lake often, but when I do, I can't resist getting a butter tart. They are so delicious but so rich. You can't have more than one at a time. I have to say I blame Joel for introducing me to these delicious treats. I found this recipe from Closet Cooking as well. After the fact, I realize that I accidentally doubled the amount of butter in the recipe. I also was only able to make 11 crusts instead of a whole dozen. 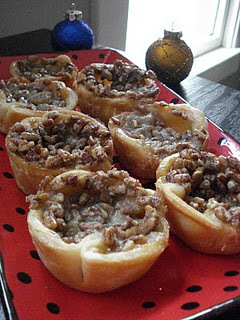 Next time, I might try making mini butter tarts using mini muffin tins. Roll the pastry out to 1/8 inch thick and cut into 12 4" circles. Press the circles of dough into a muffin pan and chill the pan in the fridge for 45-60 minutes. In a bowl, mix the brown sugar, syrup, butter, vanilla extract, salt, nuts, and raisins. Pour the mixture into the tarts and bake at 350 degrees for 15-25 minutes, or until set. ***Make sure you grease the wells of the muffin tins very good. I thought I did, but when I went to take the tarts out of the pan, only 7 of the 11 came out in one piece!!! Another cookie that I chose to make this holiday season was shortbread. I found this recipe here on Closet Cooking. I have never made shortbread before, but I love them, especially with a nice cup of tea. I thought for the holidays, to be a little festive, I'd try to somehow tie in some green and red, which is why I put dried cranberries and pistacios in one half of my batch. Then, since I had a bag of Heath bits, I put some of those in the other half of the batch. I rolled the dough out, but since I didn't have a fun shaped cookie cutter, so I used my 3 inch round one and cut them in half, making half moons. I think I may have rolled the dough out too thin because they were slightly thin and some broke when trying to get them off the pan, especially the Heath ones. Oh well, still edible and delicious! Mix the flour and salt in a bowl. Cream the butter and sugar in a stand mixer. Mix the flour/salt mixture into the the butter mixture. At this point, I cut the dough in half and mixed the cranberries and pistachios in one half and the toffee bits in the other. 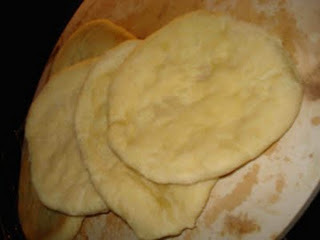 Roll the dough out on a lightly floured surface and cut the shapes you want. Bake for 8-10 minutes at 350 degrees. Like I mentioned in a previous post, I wanted to make "different" cookies this holiday season. 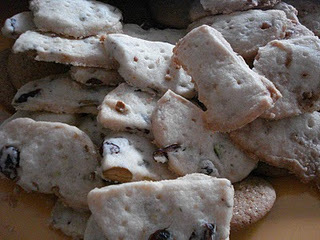 One of those cookies that I tried were these from Joy the Baker. They looked so yummy in her pictures. I didn't use molases like her recipe says to, but that is only because I had brown rice syrup in my cabinet and I read somewhere that it could be a substitute for molases. As a result, my cookies are not quite as dark brown in color. I didn't get those cool little crackles on the top of mine either. But they still look and smell delicious. This recipe made about 2 dozen cookies, plus a few extra. Sift the flour, baking soda, and salt in a small bowl. 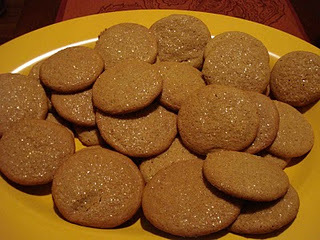 In a stand mixer fitted with the paddle attachment, beat the butter, brown sugar, and spices until smooth, about 2 minutes. Add the egg and molasses and mix until blended and an even light color, about 1 minute. On low speed, add the flour mixture, mixing just until it is incorporated. Spread the turbinado sugar into a small bowl. Roll about 2 tablespoons of dough between your hands to make a ball, then toss the ball into the sugar to coat. Place the cookie onto a lightly greased cookie sheet. Repeat until the dough is gone, placing cookies about 2 inches apart. Bake the cookies at 350 degrees for about 12-14 minutes, or until the tops feel firm and there are several cracks on top. Cool for 5 minutes then remove them from the pan. 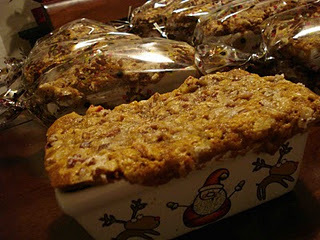 Store the cookies in a tightly covered container at room temperature for up to 4 days. 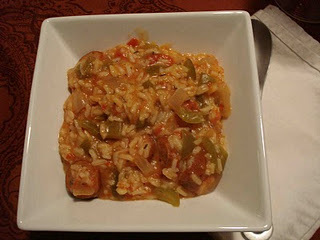 Jambalaya and Gumbo are 2 things we like very much but don't have often. I can't remember ever actually making Gumbo but I found a recipe in the cook book that came with my Crock Pot. This recipe is loosely based off of that. You see, we kind of forgot to start making dinner this morning when we woke up since we were both so consumed with going on our "top secret Christmas mission" for each other's gifts. So, when we got home at 5:00ish, we figured we had to modify. So we scrapped the use of the Crock Pot and made it on the stove instead. It was good, but a little spicy for my liking. Combine the broth and tomatoes in a large stock pot. Add the flour and stir until combined. Add the sausage, onion, pepper, and spices and stir well. Cook on medium heat for about an hour. Cook the rice according to package directions. Portion out the rice in bowls and ladle the gumbo over it. I remember going to craft shows with my mom when I was younger. One of the things I remember the most about the craft shows was the roasted nut stand. Without fail, there was always a booth that sold hot roasted nuts, and you could smell them a mile away! I've never actually made them myself, mostly because I had never found a recipe for them. When I found this recipe on The Sisters' Cafe, I figured it was worth a try. I decided to make these to go along with my Christmas cookies this year, which I still have not finished! Cover a baking sheet with parchment paper or non-stick spray and preheat the oven to 250 degrees. In a bowl, combine the sugar, salt, and cinnamon and set it aside. In another bowl, slightly beat the egg white. Add vanilla and beat until very frothy but not stiff. 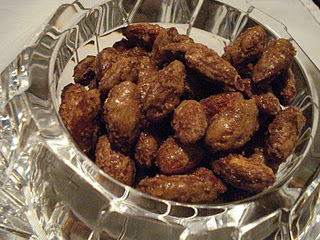 Add the almonds and stir until well coated. Add the cinnamon sugar mixture and toss until evenly coated. Spread the almonds evenly on the prepared baking sheet. Bake for 1 hour, stirring half way through. Allow to cool and store in an airtight container. 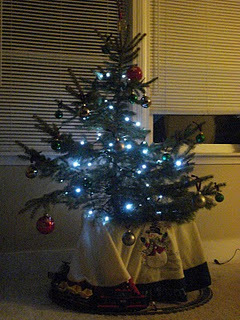 We put up our tree tonight (yeah, I know, its pretty late) and we didn't feel like eating a big dinner. Because of this, we decided to have something quick and easy for dinner tonight. We thought this recipe from Love and Olive Oil (originally from Giada De Laurentiis) sounded delicious. We didn't have any tortellini in the house, but I have had a package of gnocchi in the freezer that I wanted to use up so I figured I'd substitute those instead. ...well, I ended up eating a grilled cheese sandwich for dinner tonight and Joel ate a tangerine. Bring a pot of water to a boil over high heat. Add the gnocchi and cook acording to package directions. Drain and put them into a large serving bowl. Meanwhile, in a medium saucepan, cook the butter over medium heat, stirring occasionally. When the foam subsides and the butter begins to turn golden brown, turn off the heat (about 3 minutes). Let the butter cool for about 1 minute then stir in the balsamic vinegar, salt, and pepper. 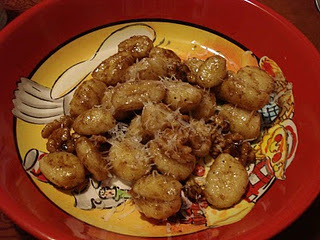 Transfer the gnocchi to the pan with the balsamic brown butter. Sprinkle the top with walnuts and parmesan cheese. Here is our little tree. Its not exactly the best tree I've ever seen but it will do. This is my first time ever having a real tree. The best part about our tree is that the roots are still attached and wrapped in a burlap sack, so after Christmas we can plant it rather than throw it out. Because of the roots, the only thing we could use to hold the tree was a rectangular Rubbermaid container! Luckily, Joel's Lego train was still able to fit around the bottom!! After Christmas, we plan to take it to my in-laws' cabin and plant it there. Maybe some day it will grow to a big normal looking tree!! A few years ago, my mom received a loaf of this bread from a friend of hers at Christmas time. This year, when I was looking for something to make for the girls at work, I decided I would try this. I found mini ceramic loaf pans with christmas designs on them at AC Moore for $1 a piece. I made 3 batches of bread batter and it filled all 9 loaf pans with enough to spare to make probably 2 or 3 more! They all ended up overflowing and making my oven smoke. Anyway, after I cleaned it all up, I put the loaf pans in cute cellophane bags and gave them as gifts along with a recipe card for this bread. It was a success. They all loved it! Heat the oven to 350 degrees and coat a 9x5 loaf pan with non-stick spray. In a bowl, stir oil and sugar together with a spoon. Stir in the eggs until blended. Add the pumpkin and milk. In a separate bowl, combine the flour, baking soda, salt, cinnamon, and ginger. Add to the pumpkin mixture, stirring until well combined. Stir in the pecans/cranberries. Pour batter into the prepared pan. In another small bowl, combine the topping ingredients until mixed and crumbly. Sprinkle the topping over the batter. Bake for 55-60 minutes or until a toothpick comes out clean. Cool for 10 minutes before removing from the pan. If you use a 5 3/4 by 3 inch pan, you will have enough batter for 2 loaves plus a little extra. I could have sworn that my pans were that size, and I had enough for 4. Make sure that you don't fill the batter to the top of the pan, but instead only about 1/2 way up. Also, do yourself a favor and put the pan on a cookie sheet so that in the event that it does overflow, you have something to catch the pieces rather than having your oven smell like it is on fire!! My cousin and I joined a bowling league this year. It's the same league that my parents have been on for several years. Every year, in December, they have a little "Christmas Party" where everybody brings a snack to share, pizza and wings are ordered, and you eat in between your games. Tonight just happens to be bowling night. I decided I was going to make a pizza dip to bring. I've seen several variations of this recipe floating around, but I decided to go with one that I had at a recipe swap with my sorority last year. It is super easy and I remember it being very good. I will serve it along with Triscuit crackers. Of course, I forgot to take a picture of this delicious dip, and it was gone before I had the chance!! Better luck next time!! But try this, its really good! In a small bowl, mix cream cheese, sour cream, oregano, garlic powder, and red pepper. Spread evenly in a 9 or 10 inch glass pie plate. Spread with sauce, then sprinkle with onion and pepperoni. Bake for 10 minutes at 350 degrees. Add the cheese and bake for an additional 5 minutes or until the cheese is melted. Serve with crackers. The other night, we made our own falafel wraps for dinner. We cheated and bought a box mix where we only had to add water. Surprisingly, they were actually pretty decent. On the side of the box (Fantastic Foods brand, I think) there was a recipe for "cucumber yogurt sauce" which sounded an awful lot like tatziki to me. I made it for our wraps and it was good. I used the leftovers to eat with bagel chips as a snack. Try to strain the yogurt for a little while before making this sauce so that it can thicken. Mix all ingredients together in a bowl and allow it to sit for the flavors to marry, at least 30 minutes. 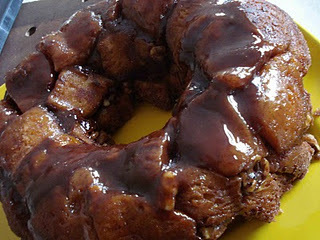 I didn't know what monkey bread was until about a year ago. It sounded so good and I was planning on buying one of those kits you see at the store-the ones that have the pan as well as the packaged ingredients. Then I found this recipe from Ezra Pound Cake, which was clearly a better option than buying yet another pan! Every year, Joel's aunts get together to make homemade pierogis that we eat on Christmas Eve. This year, I was asked to come help. I am so excited to learn! I thought it would be nice to bring something to snack on while we cooked, so I made monkey bread. It was super simple and everybody enjoyed it. Preheat the oven to 350 degrees and grease a bundt pan with non-stick spray. In a bowl, combine the cinnamon and sugar. Cut the biscuits into quarters. Dip them in the melted butter and roll them in the cinnamon sugar. Place the pieces in the bundt pan and toss the pecans/walnuts in with the biscuits at random. Pour any remaining butter and cinnamon sugar evenly over the top of the biscuts. Bake for 40 minutes or until the top springs back when touched. Cool and then invert onto a plate. 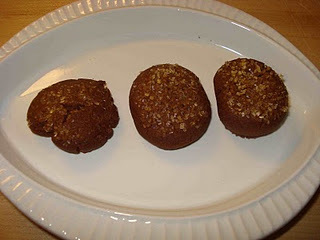 We have a bakery/cooking school near by and they have the most amazing chocolate cayenne cookies. When I found this recipe on Figs in My Belly it reminded me of them. This is the first of several kinds of cookies I plan to make it for Christmas this year. I wanted to try something a little different, instead of having the same cut-outs, chocolate chip cookies, peanut butter blossoms, etc. that we seem to make every year. I made a minor change from the original recipe in the way I baked the cookies. Instead of forming a log and slicing like suggested, I formed 30 little balls, flattened them a little bit, and dipped the top in the turbinado sugar. Then, since I wasn't ready to bake them all right away, I froze them individually on a baking sheet (so they wouldn't stick together and become one big frozen dough blob) and then put them in a freezer bag. When I am ready to bake the cookies, I will defrost them in the fridge before transferring them to the oven to bake. **Note: I baked 3 little cookies when I made them tonight just to try them out. Since Joel was busy studying hard for his GREs, I thought it would be a welcomed treat. He popped the bite-size cookie into his mouth and immediately said to get him milk. I thought he was exaggerating when he said they were dry, but then I tried one. Like he said, my mouth became so dry that I thought I'd choke on the cookie. Do yourself a favor and make sure you have something to drink with these cookies! Otherwise, they are delicious! Cream the butter and powdered sugar in a stand mixer fitted with the paddle attachment until light and fluffy. Add the vanilla extract and beat until smooth. Sift the flour, cocoa powder, black pepper, and cayenne together and add it to the butter mixture. Mix until a fudge like batter forms. Tip the dough out onto the counter and roll into little balls. Lightly press the top of the balls into the turbinado sugar. Place on a parchment lined or lightly greased cookie sheet and bake for 12-15 minutes at 350 degrees. 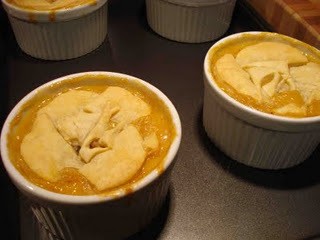 I found this recipe on The Nest, but it originated from Cooking New American. Everything in it sounds great, especially the garlic part! I swear we must eat garlic every single day. This recipe couldn't have been any easier. I can see this becoming a staple in our house. It was the perfect thing to warm us up on a really really crummy night and we even have enough for tomorrow too! Melt the butter in a large saucepan over medium-high heat. Add the garlic and saute until fragrant, about 2 minutes. Add the broth and bring to a boil. 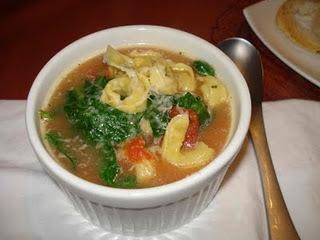 Add the tortellini and cook it about half way, about 5 minutes (less if fresh). Add the tomatoes with their liquid and reduce the heat to a simmer. Cook until the pasta is tender. Add the spinach and basil and stir until wilted, 1-2 minutes. Serve with a garnish of grated parmesan on top. *If using regular flat-leaf spinach rather than baby spinach, remove the tough stems by folding the leaf in half lengthwise and pull like a zipper. We had these potatoes as a side dish with our dinner one night last week. They are delicous and incredibly easy. We started by pre-cooking our potato in the microwave. Pierce the potato in a few places with a fork and put it in the microwave (we put it on the potato setting). When it is done, cut it in half and scoop out the insides, putting them into a bowl. Mash the potato in and sprinkle in a little bit of butter, brown sugar, and cinnamon. Replace the mashed potato back into the skins, sprinkle a bit more brown sugar on top with a few toasted walnuts. Bake the potatoes at 350 degrees for 10-20 minutes. I had a Christmas party tonight with some of my girlfriends. Every year, we do a dinner and each person brings something. This year I was in charge of a veggie dish. The dish that I made is somewhat of a family recipe. Somebody always seems to make this for each family function that we have. I can't say I can blame them because it couldn't be any easier! I doubled the recipe below for tonight. Quite honestly, I can't remember a time when the recipe wasn't doubled! Everybody loved the dish and it was all gone before I had the chance to take a picture! Next time, I'll try to remember to take the picture before the dish is served. In a 1.5 quart casserole dish, combine the corn, flour, sugar, egg, milk, salt, and pepper. Mix together and then dot the top with butter. Bake at 375 degrees for 30-40 minutes. Today was a lazy Sunday. After going to an open house, we came home and started to make spaghetti sauce to have for dinner tonight. I added sliced mushrooms to the sauce this time. We let the sauce cook for about 4 hours. Meanwhile, we wanted to try something a little different. 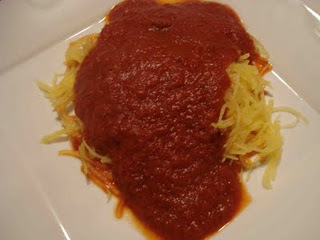 Instead of making noodles to go with the sauce, we decided to try spaghetti squash. I took a spaghetti squash and cut it in half lenghtwise. I scooped out the seeds and placed the halves cut side down in a baking dish filled with about 1/4 inch of water. I put it in the oven at 375 degrees for about 30 minutes. 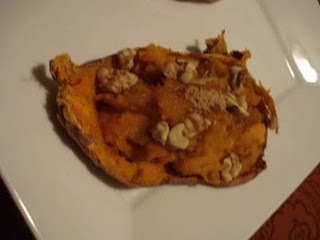 Once it was done cooking, using a fork, I scraped the squash out of the skin. As it was scraped, it resembled spaghetti noodles. We topped it with sauce and ate. The other night, we made a slightly different variation of this recipe that I have made in the past. We've been on a meat-free kick lately and needed something quick for dinner so we put these together. They were pretty good, but honestly, they would be better as an appetizer than a meal. I think I'll try this again as individual crescent rolls for a Christmas party we'll be going to. Unroll the crescent rolls and make 4 rectangles, pressing the 2 triangles together. Spoon pesto onto each of the rectangles and top with a little bit of onion, roasted red pepper, sun dried tomatoes, and goat cheese. Fold up the rectangles and place them, seam side down, onto an ungreased cookie sheet. Bake at 350 degrees for 20-25 minutes or until golden brown. I found this recipe on 30 Bucks a Week. Joel used pita for his lunches very often so we decided to see what it would be like to make it ourselves. He made this one day while I was at work. While it used ingredients we always have on hand, he was discouraged by how long it took to make these. Although it tasted ok, we decided that from now on, it might be worth spending the extra buck or so to buy pre-made pita. Combine flour, oil, yeast, salt, and sugar in a food processor. Turn it on and add 1 cup of warm water through the feeding tube. Process for about 30 seconds. The mixtrue should form a sticky ball. If you need more water for the dough to come together, add it gradually 1 tablespoon at a time. Form the dough into a smooth round ball. Transfer the dough to an oiled bowl and cover with plastic wrap and a towel. Place the bowl in a warm, draft free place for 1-2 hours, until the dough doubles in size. When it is ready, divide it into 6 pieces (it could be more, depends on how big you want your pita). Roll each piece into a a round ball and place it on a lightly floured surface. Sprinkle each with a little more flour and warp with plastic wrap and a towel again. Let them rest until they puff slightly, about 20 minutes or so. Roll our each ball into less than 1/4 inch thickness on a floured surface. Let the discs rest for another 20 minutes or so while the oven preheats to 350 degrees. Slide the discs onto a pizza stone or a cast iron skillet (or on a cookie sheet) and bake them until they are lightly browned on each side, about 2-3 minutes per side. 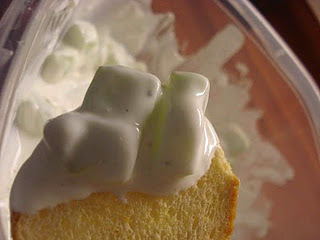 I found this recipe over at Annie's Eats. I changed it a little bit by making it meatless. I used vegetable broth instead of chicken broth and I omitted the chicken. I also don't have the patience to make my own crust, at least not yet, so I used a piece of puff pastry. It wasn't too hard and it turned out pretty good. The sauce was a little thick, even after adding double the amount of broth, but its ok. They definitely warmed us up on a cold night. To make the filling, melt the butter in a large skillet over medium heat. Add the onion and potato to the pan and saute for about 5 minutes. Mix in the garlic, bell pepper, and mushrooms and cook until the potatoes are tender, about 15 minutes. When the veggies are done, turn off the heat and add the frozen peas & carrots. Stir in the red pepper flakes and season with salt and pepper. To make the sauce, melt the butter over medium heat in a large saucepan. Add the flour and whisk until smooth. Whisk in the broth and cook over medium heat until the sauce thickens to the consistency of cream soup. Mix in the half & half, hot sauce, and salt & pepper. Pour the cream sauce over the veggie mixture and stir to combine well. Spoon the mixture into 6-8 individual oven-safe dishes. *We used 4 ramekins and then a small LeCruset gratin dish. Defrost a sheet of frozen puff pastry. Unfold and cut circles the size of the ramekin (mine were a little small so I overlapped some). Place the pastry on top of the pies and bake at 375 degrees for about 25 minutes, or until golden brown. 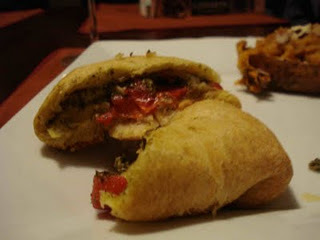 I found this recipe here from Joelen at What's Cookin, Chicago? It was different but pretty good. We scaled her recipe down, since it was just for the 2 of us, and we still had leftovers. The recipe below reflects my changes. It was definitely a decent meal on the lighter side, which was perfect for tonight. Prepare the rice according to package directions, substituting water with broth. Add salt, bay leaf, and thyme to the pot. Once the rice has been cooked, set it aside. In a skillet, heat the oil over medium-high heat. Add the garlic and onions and saute until softened. Add the mushrooms, stirring occasionally for 5-6 minutes or until lightly browned. Remove from heat, drain, and set aside. In a small bowl, whisk together the oil, vinegar, shallots, cumin, thyme, and pepper. Season with salt and add the dried fruits. In a salad bowl, combine the rice, mushrooms, and walnuts. Toss with the vinaigrette and fruits. 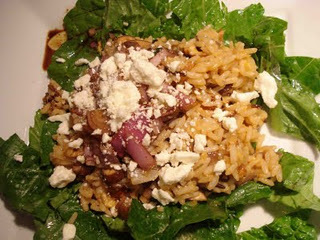 Serve over greens and top with goat cheese.